Now, lest you think this is all about feeding my chocolate addiction, I want to add that more and more research is showing that chocolate – especially dark chocolate – offers amazing health benefits, from boosting hearth health, to protecting us from UV damage from the sun, to improved vision. For more on these benefits (and more) see this great article. 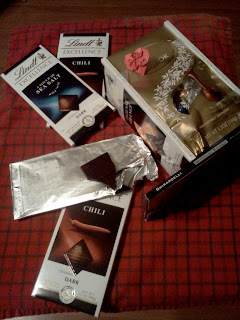 It’s amazing to me that you get all that from indulging in yumminess like this! Sometimes I change it up. 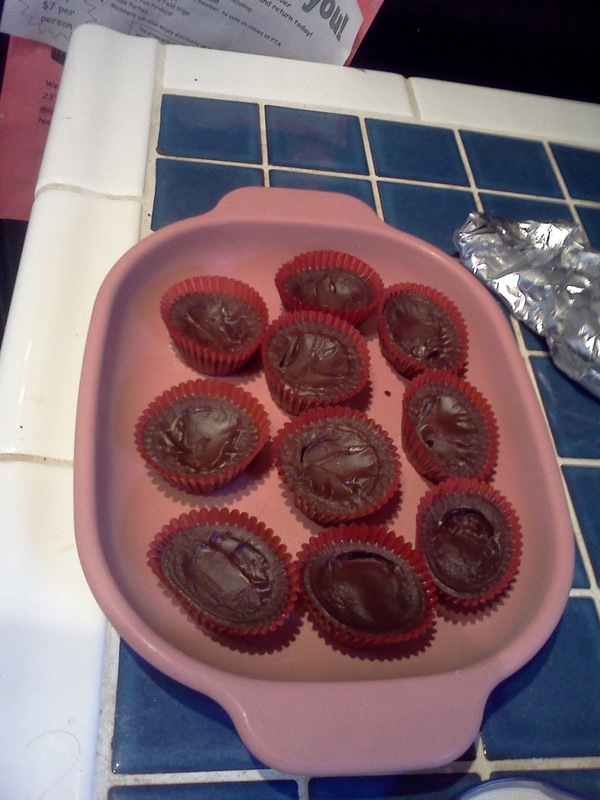 I made this batch in a mini muffin tin, with (from left to right) chopped walnuts, a mix of walnuts and coconut, unsweetened shredded coconut, and nothing – that is, just plain jane unadulterated chocolate. 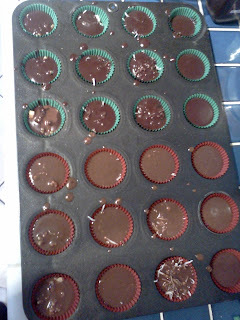 Only it wasn’t really plain jane; the top half, with the green cups, got regular deep dark chocolate with just cocoa powder, and the bottom half, with the red cups, got peanut butter cup chocolate, with half peanut flour and half cocoa. 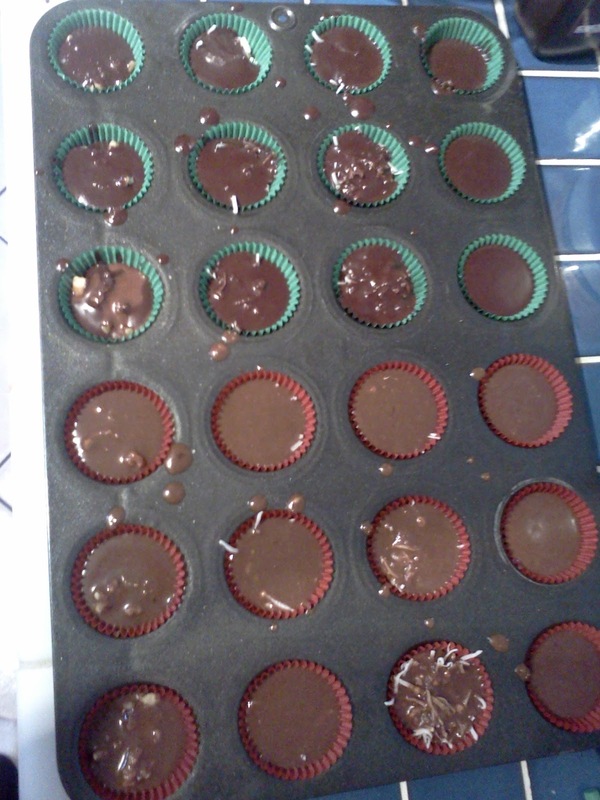 I promise, none of it got a drop of the chocolate syrup that somehow made its way into the previous pic! My convenient color-coding wasn’t really necessary – as you can see from the finished product, the different mixes were evident in the color. Really, this is such a nice treat! It calms me down, fills me up, and satisfies me in a way that even an endless supply of sugar-filled milk chocolate cannot. It’s so magical that when I was deep in the throes of a hectic Spring semester and was pining for sandy beaches and relaxation, I used my skinny chocolate to transport me there. I’m linking up to Trim Healthy Tuesday over at Gwen’s Nest and Stacy Makes Cents – come on over and check out all the yummy treats to be found today! 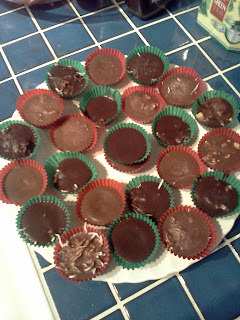 This entry was posted in food, Trim Healthy Tuesday by expatprep. Bookmark the permalink. Yum – thanks for sharing! 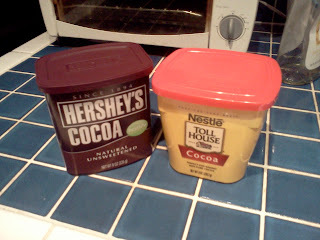 My skinny chocolate looks terribly boring next to yours . . . I’m going to try something fun next time! Fun shapes and ingredients make it so much fun to eat!! Way better than when I just poured it in a plate and stuck it in the freezer! We LOVE skinny chocolate here! I like Hersheys too. 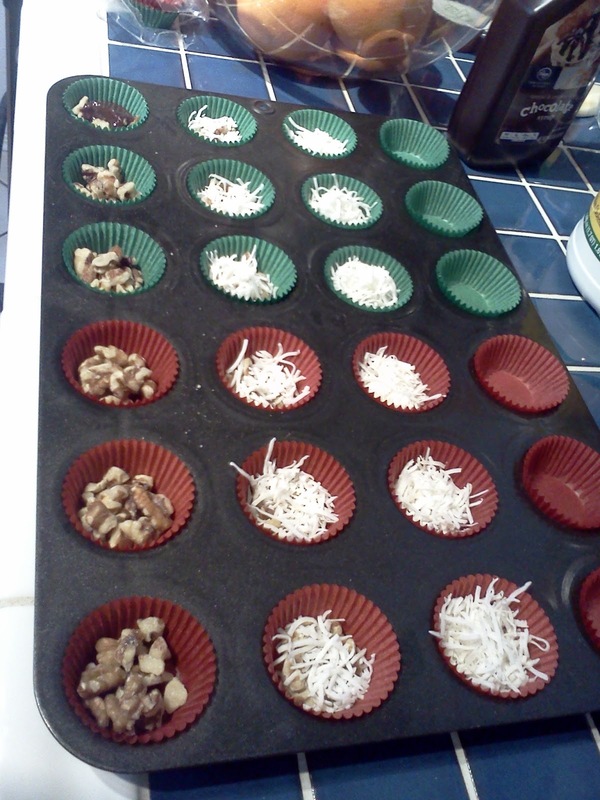 We enjoy putting shredded coconut and pistachios on ours. YUMMY! Thanks for linking at Trim Healthy Tuesday! !